What Are the Stages of Sunflower Growth? What we commonly refer to as a sunflower seed, the black-and-white hard-shelled item we often snack on, is referred to as the achene (fruit). The fruit wall is the shell, and the softer inner piece is the real seed. 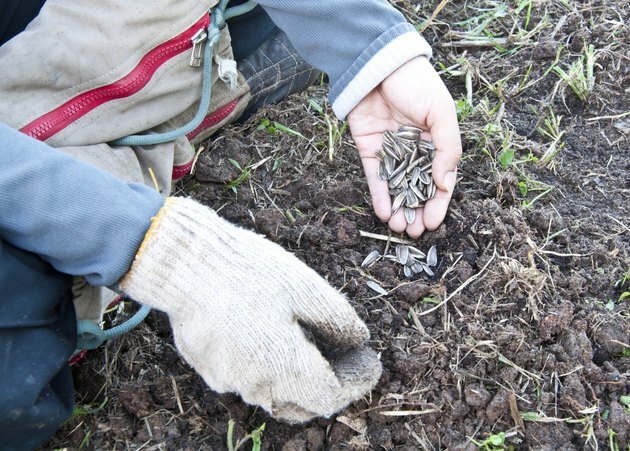 A gardner plants sunflower seed in the soil. The seed contains more nutrients than its small size might indicate. 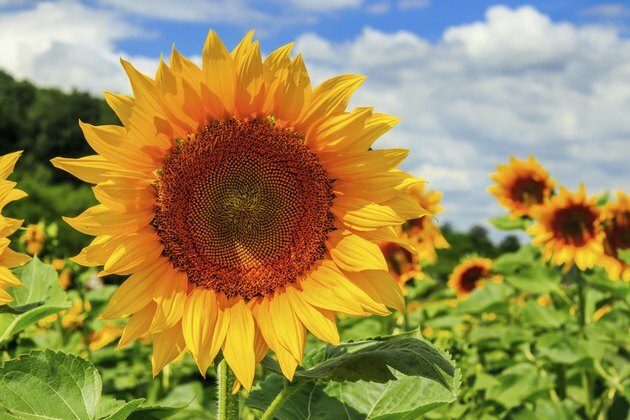 From fiber and protein, to unsaturated fats, zinc, iron and Vitamin A, Vitamin D, Vitamin E and Vitamin B complex, all can be found in the unassuming sunflower seed. To start your seed on its path to full-grown sunflower, the seed needs to be planted in a sunny spot where it will receive full sun all day. It will tolerate many types of soil conditions, but it will not do well in shade or even partial shade. Keep the soil moist, but not soggy. Once it begins to grow, dry conditions will cause it to wither and die. A close-up of a sunflower sprout growing in a row. Once the growing conditions have been met and maintained, the seed will germinate and begin to grow into its next stage, the sprout. This stage is short as it quickly matures into a seedling. Note: Many people soak their sunflower seeds in water just until they sprout. This in itself is an edible food known as "sprouts." Similar to alfalfa sprouts, they are eaten as is, or added to salads, sandwiches and meat dishes. Referred to as a living food, the sunflower sprouts are highly nutritious and have fewer calories than the seeds themselves, but more of the vitamins and supplements of the dry seed. Rows of sunflower plants grow taller in a field. The seedling has a long way to go to be recognized as a sunflower. Started in a full sun location, it will need to be watched carefully so it does not dry out. This may require daily watering, if there is no rain. As it reaches the young sunflower stage, its stem will become sturdier and thicker. At that point, watering can decrease to every other day or so. A close-up of a sunflower bud. Once the plant reaches a height of 1 to 2 feet, it starts to be recognized as a sunflower. It reaches for the sky growing ever taller, while at the top of the stem the bud starts to form. Unless the area is experiencing a drought, at this stage the sunflower can rely on regular rainfalls to get its needed moisture. If you were to watch sunflowers during this bud stage, you would see the flowers follow the sun. They start the day facing the east as the sun rises. In a process known as heliotropism, the developing bud will follow the sun from east to west. By morning, it is again facing east, awaiting the sunrise. The head of a sunflower in full bloom in a field with others. Once the plant begins to bloom, it has reached its adult stage. The bright yellow top of the common sunflower is not a flower, but a head. It is made up of many flowers tightly packed together. The flowers that make up the head are divided into two groups. The outer flowers are called ray florets, while the inner flowers of the circular center are known as disc (disk) florets. These disc florets will mature into what we commonly call the sunflower seed. This part, however, is the fruit and the true seed is found inside. At this adult stage, the blooming sunflower does not follow the sun's path. The stem will have stiffened and the majority of sunflowers will face east, each day awaiting the sunrise. Once the seeds fully develop, they must be harvested or protected quickly from the birds that will swoop in to remove and eat all the seeds. 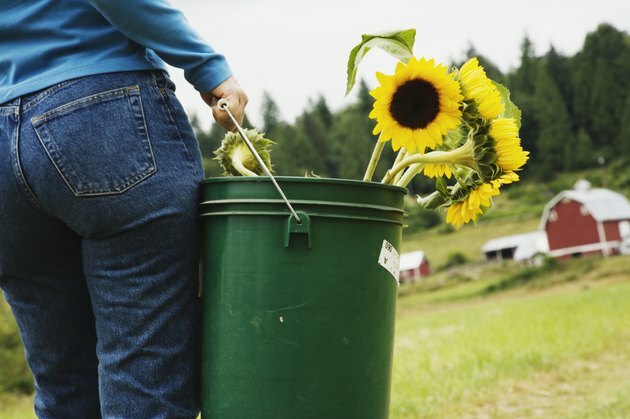 A woman carries a bucket of sunflowes across a pasture on a farm. All the parts of a sunflower have a further use. The leaves and stems are used as animal fodder. The yellow flowers are used to make dye, while the seeds can be compressed for their oil, which is comparative to olive or almond oil. The oil sees further uses as a lubricant, and in soaps and paints. The seeds, as we all know, make a great snack. Cas Schicke is a freelance writer with numerous published articles. Her topics of interest pertain to home and garden issues. Sharing knowledge about the why or how of growing things or useful home information is the main ingredient of Schicke's published articles. Her articles have been published in eHow and GardenGuides. 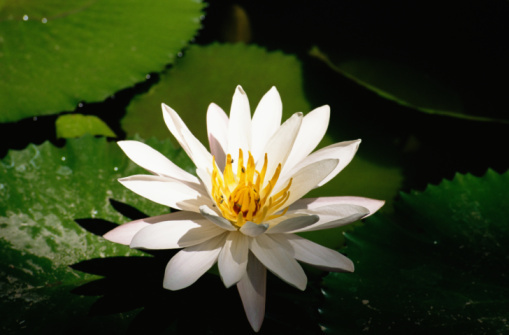 What Are the Steps of Sexual Plant Reproduction?